Here is a brief excerpt from an article by Peggy Noonan for The Wall Street Journal. I agree with her that, with the recent publication of Go Set a Watchman, a fictional hero turns out to be as complicated and flawed as the real ones. To read the complete article, check out others, and obtain subscription information, please click here. When I pointed to him his palms slipped slightly, leaving greasy sweat streaks on the wall, and he hooked his thumbs in his belt. A strange small spasm shook him, as if he heard fingernails scrape slate, but as I gazed at him in wonder the tension slowly drained from his face. His lips parted into a timid smile, and our neighbor’s image blurred with my sudden tears. If Atticus could blandly introduce me to Boo Radley at a time like this, well—that was Atticus. I’ll never forget reading that scene as a child and how my eyes pooled with tears. They did again the other day when I re-read the book. Boo, the pale hermit next door about whom the neighborhood children had spun gothic tales of derangement, was suddenly out from the shadows and revealed as a friend. And Atticus Finch, Jean Louise’s father, maintaining his composure on that dramatic evening and seeing to the small courtesies that, he knew, were part of the price we pay to continue civilization…. What a character Atticus was, a true American hero of the 20th century. He was strong but pacific, philosophical and gentle-natured. Still, on that summer day when mothers called their children in because a dog was walking erratically down the street it was Atticus who took a rifle, kneeled down, adjusted his eyeglasses and took down the rabid hound with one perfect shot. But I know how my friend felt. She herself was already launched on a great New York career when Mockingbird was published in 1960, and her heroes were those of her day, JFK, and Dr. King. But they were human and imperfect. Atticus wasn’t real, so he promised to stay fixed in time and never disappoint. I think part of his power as a figure of literature — as a figure of American life — is that he wasn’t only on the right side, he was on the right side in the right way. He was for my generation the perfect father figure: calm, reliable, full of integrity and always there—the kind of father anyone would want and few would have. He was fictional. A writer made him up. 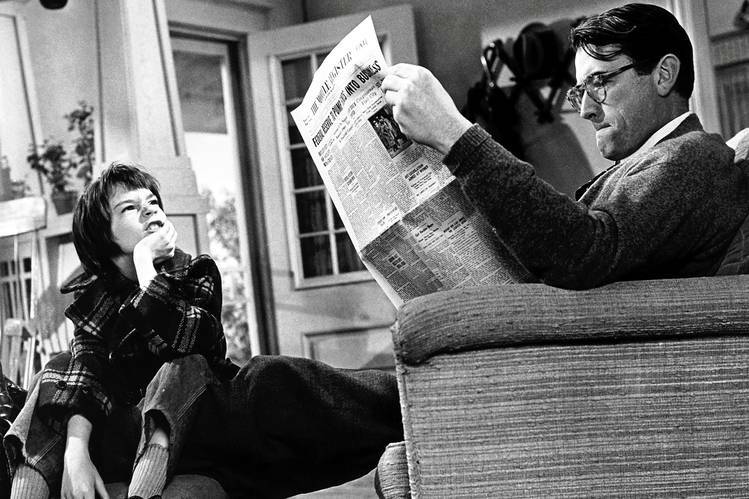 Harper Lee made up Atticus Finch just as Tolstoy made up Anna Karenina and Dickens, Scrooge. They weren’t real but through the alchemy of art wound up being more real to us than the man next door. Peggy Noonan is a columnist for The Wall Street Journal whose work appears weekly in the Journal‘s Weekend Edition and on OpinionJournal.com. She is the author of eight books on American politics and culture. The most recent, Patriotic Grace, was published in October 2008. Her first book, the bestseller What I Saw at the Revolution: A Political Life in the Reagan Era, was published in 1990. She was a special assistant to the president in the White House of Ronald Reagan. Before that she was a producer at CBS News in New York. In 1978 and 1979 she was an adjunct professor of journalism at New York University. ← How Does Trump End?